11 Scenarios For How The Roy Moore Saga Could Play Out Republican power brokers in D.C. are devising lots of schemes to try to edge out Roy Moore, the GOP Senate nominee in Alabama who has been accused of sexual misconduct and sexual assault. Republican Senate candidate Roy Moore has been accused of sexual misconduct by multiple women, some of whom were teenagers at the time. He holds up a copy of his handbook, One Nation Under God. 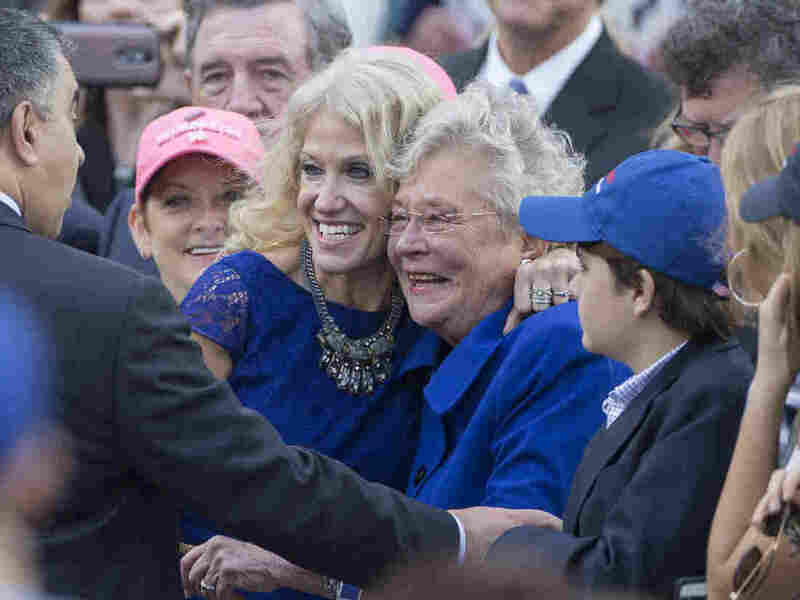 But, speaking Friday, Kay Ivey, Alabama's Republican governor, said she saw no reason why the election should not proceed as planned next month. And she holds many of the cards in the Moore saga. She set the election date, and in a number of scenarios, she has some discretion to appoint someone else temporarily (Luther Strange had been appointed by her predecessor) or set a new special election date. Some have looked to her to help national Republican leaders out of the jam they are in — something Ivey has said she will not do. "I will cast my ballot on [Dec. 12]," Ivey said. "And I do believe that the nominee of the party is the one I will vote for." She said she is voting for Moore because "we need to have a Republican in the United States Senate" to vote for Supreme Court justices, among other things. At the same time, Ivey said, "I have no reason to disbelieve any" of the women accusing Moore of sexual assault, many of whom were underage at the time. The analysis below is based on NPR's reporting and conversations with the Alabama secretary of state's office. Doug Jones, Democratic candidate for the Senate, meets with voters at a Mexican restaurant in Talladega, Ala. This is quite possible. Both a recent Fox poll and an NRSC poll have Moore losing support. 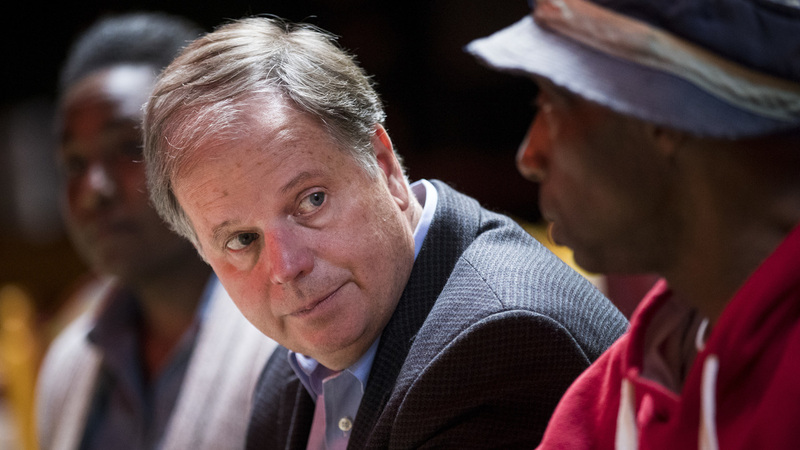 If Jones were to win, he would become the first Democratic senator elected from Alabama in 25 years. A Jones win would also narrow the gap from a 52-48 GOP advantage in the Senate to 51-49, opening up an avenue for Democrats to take back the Senate in 2018. Of course, there is no telling exactly how Jones would vote. He would represent Alabama, a conservative state that went overwhelmingly for Donald Trump, and if Jones wants to have a chance at being re-elected, he most likely can't vote as a liberal. 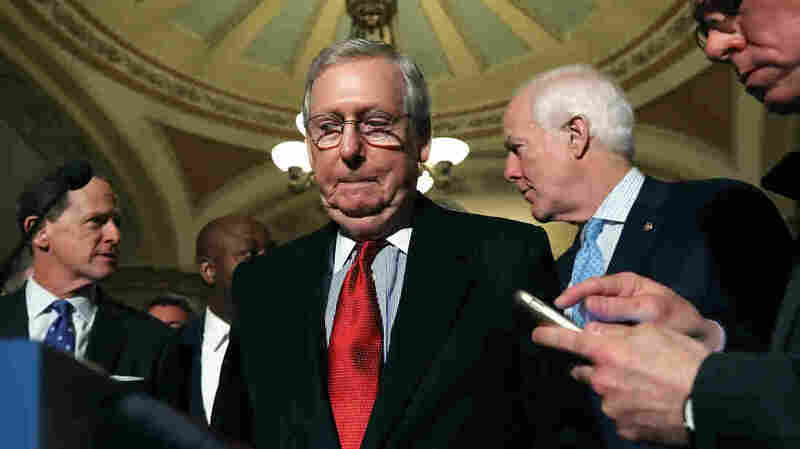 Senate Majority Leader Mitch McConnell of Kentucky has been trying to figure out maneuvers to keep Alabama Roy Moore out of the Senate, run a new candidate or expel him if he wins. While those two recent polls show Jones leading, it's still Alabama. There are lots of Republicans in the state that Trump won overwhelmingly, so no Republican can ever really be counted out. What's more: Automated polling has shown Moore and Jones in a tighter race. Could that mean Moore supporters would rather not tell a live pollster they're for him but are OK simply pressing a button? That is one theory. The point is: Moore could still win. When it comes to the idea of blocking Moore from being seated if he wins, that very likely wouldn't stand. Democrats tried this in 2009 with Roland Burris, the Democrat appointed by disgraced former Illinois Gov. Rod Blagojevich, who tried to sell Barack Obama's Senate seat. Democrats refused to seat Burris, claiming his credentials weren't in order. "Before a new senator can take the oath of office, an election certificate must be presented to the Senate to confirm that the person was duly elected. Issued by the secretary of state representing the state of the incoming member, the election certificate is affixed with the state's official seal and is delivered to the secretary of the United States Senate for official recording." Lots of powerful Republicans have lined up against Moore. Gardner, for example, has called for his expulsion should he win next month. The Senate needs a two-thirds majority to expel a member. But it's rare. It hasn't happened since the Civil War. A dozen members since 1980 have actually continued serving while facing indictments. Others have resigned while facing expulsion — most recently John Ensign of Nevada in 2011 and Bob Packwood of Oregon in 1995. But Moore, who shows no signs of stepping aside before the election, would very likely be emboldened if he were popularly elected. Expulsion could be in vogue. Some are calling for Sen. Al Franken's removal after an allegation of sexual assault arose against the Minnesota lawmaker on Thursday. McConnell referred two Democratic senators' conduct to the Senate Ethics Committee for review Thursday — Franken and New Jersey's Robert Menendez, whose corruption trial ended in a mistrial this week. McConnell would very likely face pressure to at least take the same step for Moore. But the Ethics Committee generally only looks at conduct while a member was serving, not before — and the allegations against Moore are 40 years old. Would you sacrifice control of Congress for ... morals? Maybe. "The Republican Establishment is trying to maneuver out of the binary choice of electing Roy Moore or putting their control of the upper chamber at risk by exploring exotic schemes, like voting to deny Moore a seat if he wins and replacing him with another appointed Republican. But if their machinations fail, they'll be faced with a stark choice. "It's easy to feel superior about this when opposition to grotesque treatment of teenage girls lines up neatly with your own party's well-being. If you're a liberal, ask yourself what you would do if the circumstances were reversed. Give the other party a Senate seat and a possible majority, and forfeit your control of staffing the Cabinet, appointing judges and passing laws you consider vital for the country's future? Or allow one of the votes for those things to be cast by a sexual predator?" Kellyanne Conway poses with then-Alabama Lt. Gov. Kay Ivey last year. Ivey is now governor and said she's still voting for Roy Moore even though she said she has no reason to disbelieve his accusers. First, we should say, the state party has shown zero willingness to do this at this point. But, for the sake of what ifs, here's how this could play out: If the party were to formally withdraw Moore's nomination, his name would still appear on the ballot. State law says that someone can only be added or replaced on a ballot 76 days prior to an election. 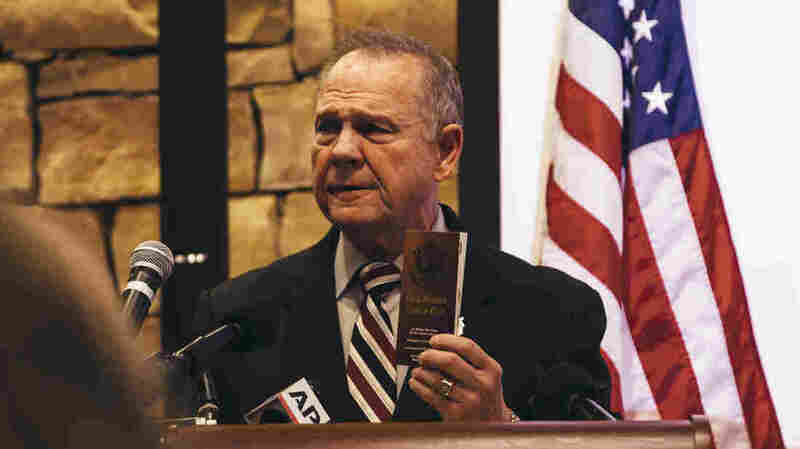 The Senate would consider Moore's credentials to not be in order. A new special election would be called. The governor would have to call one "forthwith," which is vague. All that means is quickly and within a reasonable time frame to be able to pull one off, but it's open to Ivey's interpretation. But such a scenario might leave the Alabama GOP open to a suit by Moore or his supporters for essentially not allowing Moore's candidacy to proceed in the Dec. 12 vote or for essentially disenfranchising Moore supporters. 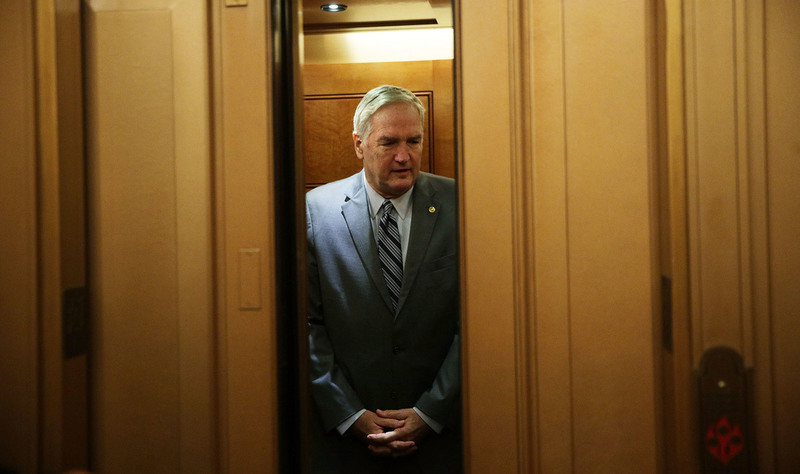 Appointed Sen. Luther Strange, R-Ala., takes the elevator as he arrives at the Capitol for a vote. This has been floated by some Republicans in Washington. Strange, who was appointed to the seat when Sessions was named Trump's attorney general, lost to Moore in the GOP primary. There is a "sore loser" rule in Alabama that says no one who runs in the primary can run on the ballot in a general election. In other words, Strange can't run as an independent or in association with some other party that officially appears on the ballot. But that doesn't apply here. It would be legal to wage a write-in campaign. 3. The last successful Senate statewide write-in effort was in 2010 when Sen. Lisa Murkowski, R-Alaska, did it. But that was in Alaska. The Murkowski name is well-known in the state as her father was a senator there, too. And Alaska's population is less than 742,000. Alabama's is about 6.5 times that. Attorney General Jeff Sessions testifies on Capitol Hill earlier this month. Sessions would have some inherent advantages that Strange does not. It is, after all, Sessions' old Senate seat, which he held for 20 years before stepping down to become attorney general. So he is well-known statewide. 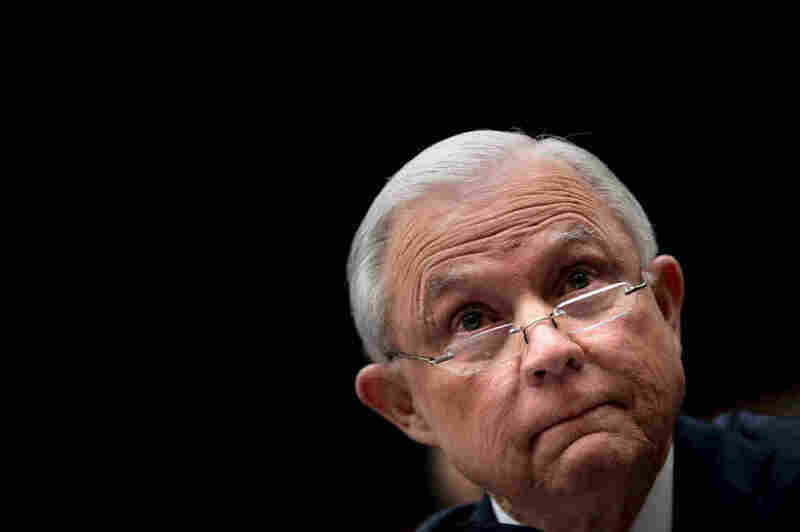 What's more, think of the dominoes that would fall if Sessions were to go through with a run. Whom could Trump nominate who would be confirmable as attorney general without a major fight amid the various Russia probes? Politico notes, though, that "Senate Majority Leader Mitch McConnell and his top advisers are discussing the legal feasibility of asking Strange to resign from his seat in order to trigger a new special election." First, it's not true that Strange resigning would "trigger" a special election. The governor would have the authority to call one if she so chose. John Bennett, deputy chief of staff at the Alabama secretary of state's office, told NPR, "We are confident that governor's office can call a special again in that instance," if Strange resigned. "We maintain they [the governor's office] have the authority to do that." But "their legal counsel has said that [a new election] is not reasonable or practical or a good use of resources." But the governor's and the secretary of state's offices are aware that changing or canceling the Dec. 12 election and creating a new special election date could present legal problems, especially with regard to disenfranchisement. Absentee and overseas military ballots have already gone out, and some have already come back. And as this scenario (like Scenarios 5 and 8) essentially terminates Moore's candidacy, it also creates the possibility of a legal challenge by Moore. But, for the sake of this hypothetical scenario, let's entertain this as a possibility. It's certainly not beyond the realm of possibility, especially if more women come forward with evidence that even he can't refute. If this were to happen, the Dec. 12 election would still take place. Moore would still be on the ballot, because they're already printed. No one else could get on the ballot, because we are inside the 76-day window to add or replace anyone. A previous version of this story incorrectly said Luther Strange had been appointed by Gov. Kay Ivey. He was appointed by her predecessor.